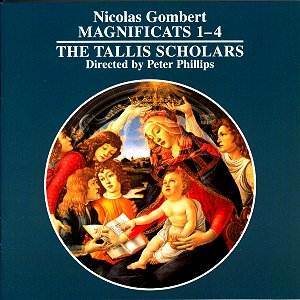 The Tallis Scholars, directed by Peter Phillips. recorded during 2000 in the Church of Saint Peter and Saint Paul, Salle, Norfolk. It is very good news that Peter Phillips is back with his wonderful recordings after the debacle with Universal. Many of the recent releases have been the older recordings of the Tallis Scholars being re-released to replace the spate of deletions which occurred after Universal took over the catalogue and then decided to no longer support the label. Many of these reissues will already be in reader�s collections, so it is very satisfying to be able to welcome a brand new issue. With this release, new areas of the Tallis Scholar�s repertoire are being established, and it is good to relate that the previous qualities of these recordings � clarity, diction, pitch, recording quality, and more than all of these, sheer pleasure involved in the sound of the Choir � remain in full measure. Nicolas Gombert was part of the Flemish Renaissance although has been considered as a minor composer (perhaps unjustifiable). His music has been studied in detail over the past few years and although his reputation is more substantial than it has been, he probably least deserves being looked at as a minor composer. He wrote eight Magnificats, generally considered to be his masterpiece, and according to the sleeve notes, the remaining four will be released next year. Each is based upon a chant (Tone) which in worship both preceded and followed the Magnificat. What we have in this recording then, is as originally performed with the Tone appearing as described. The Magnificat is based upon a Tone and so the listener can appreciate Gombert�s facility in developing the Magnificat from the chant. Where he is somewhat different from other composers of the time is in the complexity of his writing. Each work displays this, and it could be considered to muddy the textures somewhat. Such is the quality of the singing that this does not appear as a problem. Gombert often doubles the bass and tenor lines, making for a very rich texture, quite unusual for this time period. The soprano line is left as a single strand, and the alto line doubled up only rarely. In each Magnificat, variety is also introduced by having the even verses as polyphonic and the odd verses as chants. One slightly controversial point is the use of what is known as "English Clashes." These occur when reaching the end of a cadence the notes are inflected causing momentary dissonances. This technique is deployed in these performances, so we have an opportunity to hear these "clashes" at first hand rather than only in print. All the Magnificats use the same basic pattern, and start with four voices. The complexity of his writing increases throughout the work until the last verse where we can hear anything up to six voices. The range of the music is somewhat restricted, so the six strands are often packed close together. Moreover, he preserved the pitches of the chants so that the beginning, middle and end of the work was in tune with the same parts of the chants � quite a complex straightjacket to work within. According to the sleeve notes, it appears that the Magnificats were written as a summation of all of his skills partially as an atonement and also as a release ticket from serving on a galley. He had been imprisoned there on the orders of Charles V after having molested a choirboy in his care. In this age of political correctness, action groups and so on, it is only to be wondered if these works would have materialised today given the same circumstances. I doubt it. Well done Peter Phillips and his choir. A wonderful issue, and well worth buying.